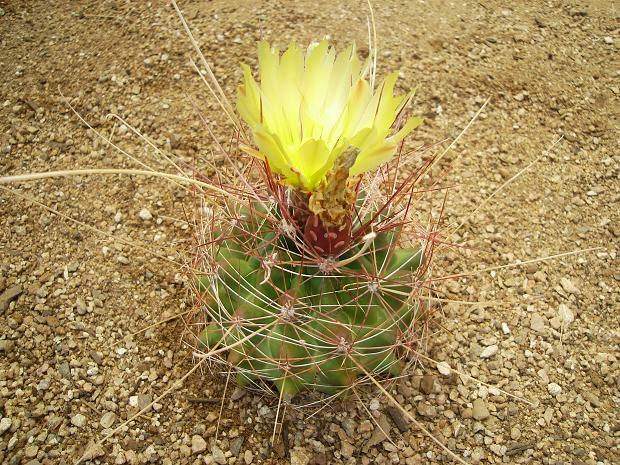 This is the most common barrel of West Texas and will eventually make an impressive specimen as it pups quite readily. In grasslands where it grows, it can be surprisingly difficult to see this plant unless it is in bloom or has maturing fruit that give it away with their bright colors. As you can see from this relatively small plant the blooms are large and spectacular. The spines that are longer than the plant is wide is also a distinctive feature. 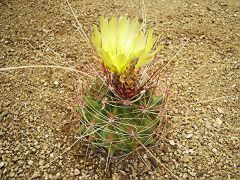 It often has to stand in snow for short times and has frosts most winters so it is a good candidate for planting out in cactus gardens. I would always recommend it be planted at a little bit of elevation from the standard grade but this is one tough cookie. 9-3-2010.